People in the coffee business call them campers. They are the individuals who spend hours working on their computer after purchasing a small cup of coffee. When a place gets crowded and other people need seats they lower their heads and burrow into those computers like turtles at the shoreline. In a busy central London location, close to a mainline train station, most people come in, buy a cup of coffee, and leave shortly for work or to catch a bus or the tube. But the campers who were already settled in their seats could be there literally for hours nursing a single cup or water bottle. “We are not an office. If you need to recharge your computer you’ve probably been here too long.” says a notice in a small cafe in Farmington, USA. The owners of a chain of coffee shops came to us looking for a Wi-Fi solution for one particular location that was suffering from lack of table space due to ‘campers’ setting up shop for several hours at a time. This outlet is in a high foot traffic area, close to one of London’s busiest rail terminals, and the owners felt that the normal customer experience was suffering due the to lack of availability of seating. They wanted to offer a welcoming WiFi service but gently discourage long-term use. The solution we provided uses unique codes to gain internet access in hour long periods. These are given out by servers on a branded token at the point of sale. 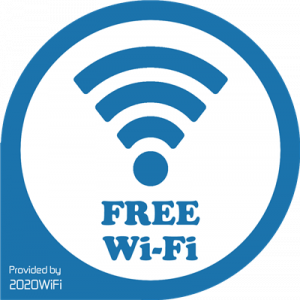 The customer can connect freely to the Wi-Fi service which appears as “open” in the network list – this is important as customers are often put off by password-protected Wi-Fi networks which appear on their phones and tablets. Once connected, they are redirected to a welcome page on their device which prompts them to enter the code to proceed to the internet. If the customer wants to use the internet for longer than the 1 hour period chosen by the cafe owner, they must return to the serving counter to request a new code from staff. Typically this prompts them to make a purchase. So at the very least the cafe owner is rewarded for providing the service. It also serves as a reminder to the customer that they’ve been online for an hour – we all know how easy it is to get distracted on the web. We asked them if customers have made comments about having to use a code – they told that it has not been a problem at all. There were a couple of existing customers who were used to the old system (and sometimes spent the better part of half a day at the café) who asked if they could bypass it, but once the reasons were explained for the new system, accepted the use of access tokens and subsequently limited their table time. “We regularly issue 1000 tokens a month so it’s clear the system is being used by customers. For the typical casual visitor seeing a seat to drink their coffee and pastry at could be the difference between coming in, or passing by. We’re pleased this solution works here. Our client is happy, the coffee drinkers are happy, and the campers? Well let’s just say they’re now paying to play” says 2020Media’s Rex Wickham. “Our client’s head office also benefits from weekly emailed statistics on customer numbers and usage at this outlet, a PCI-DSS compliant solution, and a separate staff network”. If you operate a location where table space is tight and want to offer a better service to your customers, get in touch with us to find out how we can help.